Looking for a less flashy case that is still stylish, functional, and fits in/on your desk? Need a sensible sized case to contain that power thirsty gaming rig? Then NZXT’s VULCAN mid-size tower case is designed for you! From NZXT’s crafted series comes the VULCAN, a micro-ATX motherboard case featuring enough space for 2 ATI 5970 graphics cards, 2 CD/DVD drives, up to 4 Hard drives, and up to 5 cooling fans. These features in a mid-tower case will please any computer builder looking for a small case to contain a big system. Join us as we review the NZXT VULCAN amazing use of space and design that enables users to pick hardware that would otherwise dismiss the use of a mid-tower case of this smaller size. Introducing NZXT’s new VULCAN Micro ATX gaming case, the ideal bring-your-own-computer option for professional gaming LAN parties. 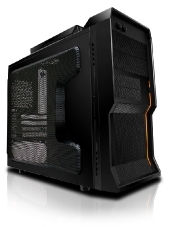 The Vulcan maximizes power in a compact 16” x 7” x 16.6” body, which is approximately 40% smaller than the typical super full tower. Indulge in the ample space that includes advanced cooling capabilities with 2 x 120mm (one included), 1 x 200mm, 1 x 80mm, a front 120mm intake fan (included), and more space to fit up to two 350mm cards in SLI and Crossfire configurations. The durable non-slip top handle and anti-vibration rubber support idealizes portability, enabling you to easily transport your ultimate gaming machine anywhere.